What's a Flight Officer? : Bridge Collapse. 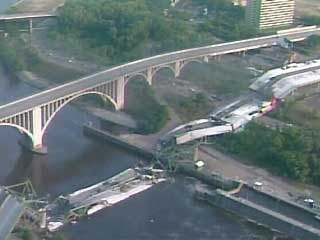 I was saddened to hear this morning of the Bridge Collapse in Minneapolis. My prayers and thoughts go out to those families who lost someone, and those families and persons who are on-scene for the ongoing recovery efforts. Semper Vigilans. However, this is a CAP site, so I must ask the question: is CAP involved? Obviously not on-scene for the recovery efforts, but in a logistical/support role. Are the SDIS planes airborne doing damage assessment? Are we transporting men and material to the scene? (Not divers for obvious reasons). Does anyone know? UPDATE: Thanks to our anonymous commenter, the CAP has not been activated. I figured the question deserved to be asked, and the above are just some of the ways CAP could help. Thank you again. No, MN Wing is not involved. SDIS doesn't transmit high enough resolution to make it better than using the TV helicopters or the state patrol helicopter. Furthermore, the hand held cameras used with the SDIS kits have poor optics and resolution, and they are not stabilized. ARCHER would be useful, except there is no process for easily exporting the geocorrected high resolution imagery into a useable file format for use in ArcGIS or similar products. CAP's communications capabilities provide little value to a metro area with interoperability between radios used by fire, law enforcement, and medical teams. So, long story short, the state EOC has been activated and is aware of CAP's resources, but has not made any requests. Cool...thank you very much. I just had to be sure.